The main cause of death in Malaysia is non-communicable diseases or also known as chronic diseases. These diseases are usually caused by unhealthy lifestyle. 2016 statistics shows that ischaemic heart diseases, pneumonia and cerebrovascular diseases are the top 3 causes of death in Malaysia. 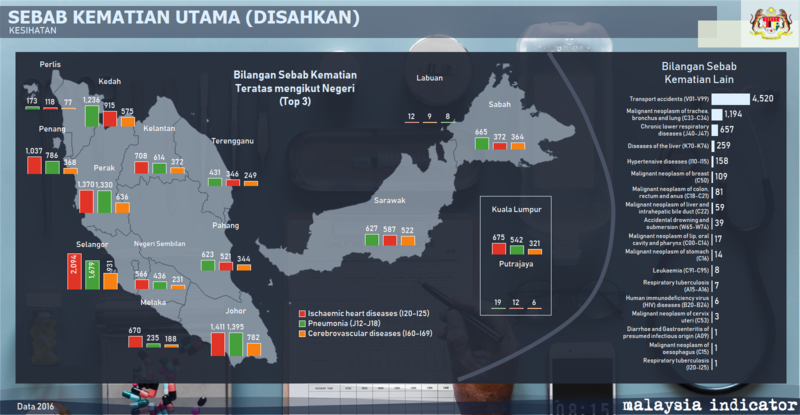 Selangor recorded as the state with the highest count of confirmed heart diseases and pneumonia cases (2,094 and 1,679 respectively) in whole of Malaysia. Meanwhile, in East Malaysia, pneumonia records as the leading cause in both Sabah (665) and Sarawak (627). Cerebrovascular diseases on the other hand records the lowest count of confirmed cases of death for all states. Other causes of death are accidents with 4,520 confirmed cases in 2016 which makes it the leading cause after chronic diseases. Just like having a healthy lifestyle, the practice of safe driving is a choice. Most deaths caused by road accidents can be avoided. Obeying the speed limit, signalling when changing lanes and stopping when tired are some of the basic practices in avoiding unnecessary accidents.